The world’s most famous investor has a love affair with the world’s largest company … and it’s easy to understand why. 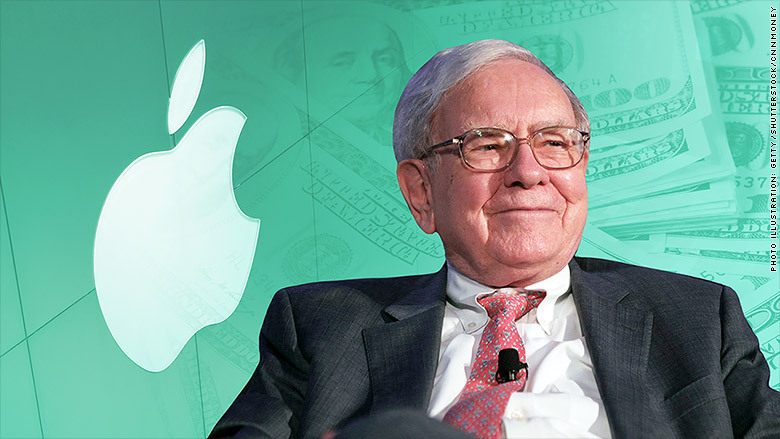 Warren Buffett has been acquiring so much Apple (AAPL) stock through his holding company, Berkshire Hathaway (BRK.A), that it has surprised pundits and prophets and probably even Apple CEO Tim Cook. After buying more than 74 million AAPL shares in the first quarter of 2018, Buffett/Berkshire now owns about 5% of the iconic i-everything producer. Those 240 million shares are worth approximately $45 billion. Forty-five billion bucks … incredible … I mean, that’s almost twice as much as Daily Trade Alert pays me! One thing for sure: If Apple is good enough for the Oracle of Omaha, it certainly is good enough for DTA’s Income Builder Portfolio. Come Tuesday, June 26, I will execute a purchase order for about $1,000 worth of AAPL, making it the 12th position in the IBP — the real-money Dividend Growth Investing portfolio we’ve been building since the start of the year. 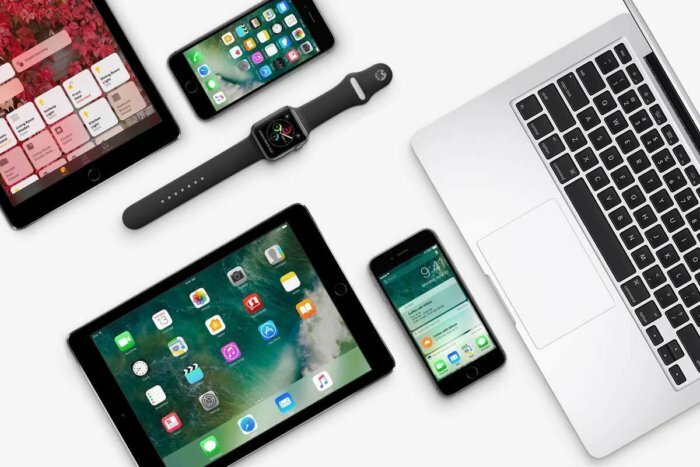 Apple will become the IBP’s first technology-sector holding … but the maker of iPhones, iPads and Macs really has become so much more than your run-of-the-mill tech company. It is a services provider, a hardware and software company, a content/entertainment provider, and (arguably foremost) a consumer-products company. Once recognized as the most innovative corporation out there, many other tech firms now can rightly claim an advantage in that department. Others have had better growth numbers in recent years. Others have higher dividend yields. Others trade at somewhat more attractive valuations. When you put the whole package together, though, it’s hard to beat Apple. The company makes a ton of money, and it has committed to returning a big chunk of it to shareholders. Over the years, Apple has been an earnings and cash flow machine. This FAST Graphs illustration shows AAPL with only two earnings declines in the last 15 years (red circled areas), and double-digit EPS surges followed immediately (blue). 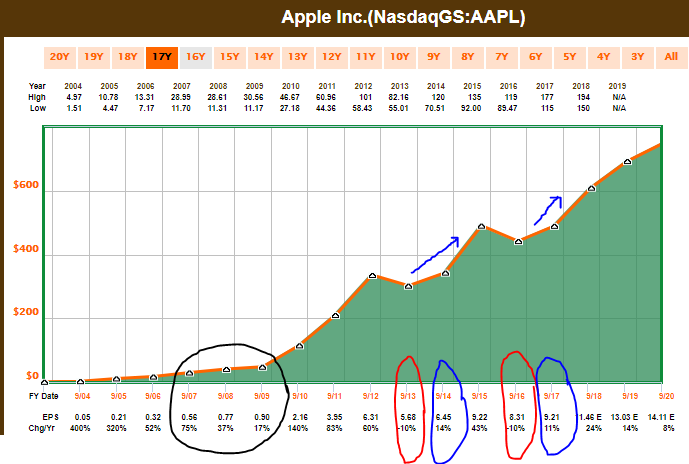 The black circled area indicates AAPL’s significant growth even through the Great Recession. The story has been similar for free cash flow. Only twice in the last 15 years has FCF declined (red circles); on both occasions, growth resumed the very next year. I clearly like Apple … and we bought about 5% of the company. And I’d love to own 100% of it. But that’s the test. Would you like to own 100% of a company? We’re not buying a stock when we buy Apple in our minds; we’re buying 5% of a business. And we like very much the economics of their activities. And we like very much the management, and the way they think, and the way they act. As Apple has built up its ecosystem of products and services, it also has built incredible loyalty among its users. Most wouldn’t switch to other manufacturers’ products if you offered to pay them to do it. Brand recognition also is sky-high. 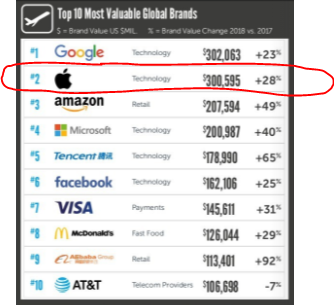 BrandZ, the world’s largest brand equity database, ranks Apple as the second-most valuable brand in the world — and closing fast on rival Google. Another major AAPL rival, Microsoft (MSFT), ranks fourth. Its co-founder, Bill Gates, was asked by CNBC what he thought about his good friend, Buffett, buying so much Apple stock. 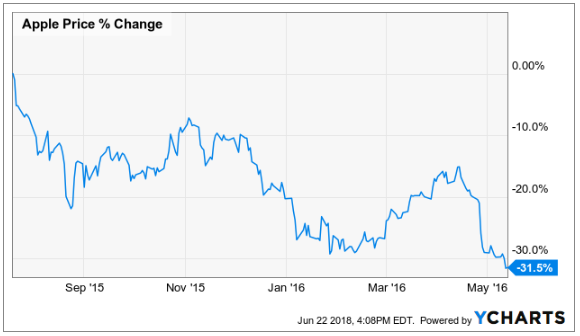 Apple’s an amazing company … and it’s not a tech speculative company where it’s still losing money or anything. So I think Warren’s applied great thinking there. The top tech companies do have a very strong profit position right now. But Apple has the most of all. When large technology companies mature, many of them start returning some profits to shareholders through dividends. Apple joined the divvy brigade in 2012 and has grown its payout nicely ever since. What isn’t shown in the above graphic: In May, Apple announced it was increasing its quarterly dividend from .63/share to .73, a 15.9% hike that is its biggest raise yet. Even with all of this aggressive dividend growth, Apple only has a 25% payout ratio, leaving this cash-generating machine plenty of room to keep the increases coming, year after year after year. 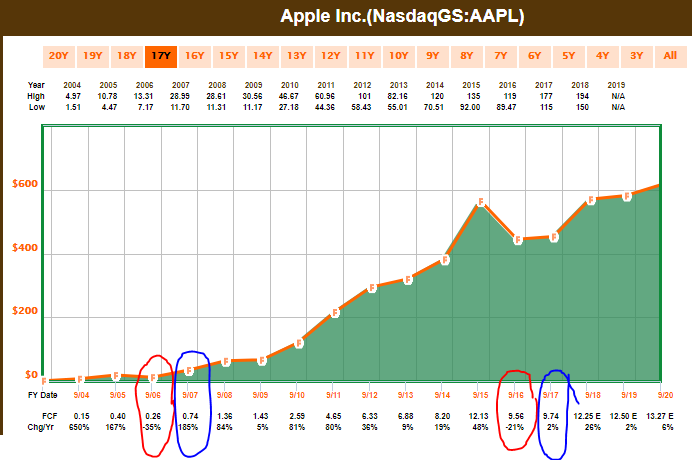 A couple of decades from now, AAPL very well could be a Dividend Champion. Also in May, the company authorized $100 billion in share buybacks — that’s on top of the $210 billion repurchase plan due to wrap up in this year’s third quarter. I’m not always the biggest fan of buybacks because I believe too many companies do them when their stock price is outrageously high. Apple, however, mostly has done a nice job of reducing the number of shares on the market by buying them back at fair value or better. Like all companies, Apple faces challenges, risks and headwinds. The iPhone is AAPL’s cash cow, and competition in that industry is extreme — not only in the United States but across the world. In a trade and technology showdown between the United States and China, Apple and Mr. Cook have a lot to lose. With 41 stores and hundreds of millions of iPhones sold in the country, there is arguably no American company in China as successful, as high-profile and with as big a target on its back. Meanwhile, investors face what I call the Risk of Great Expectations. Because Apple has been so successful for so long, it has set a very high bar for itself. So it could sell its most iPhones ever one quarter, but if those numbers are 1% lower than analysts expected, share price can be driven down forcefully. That shouldn’t bother long-term investors. Indeed, when AAPL prices tanked two years ago, I celebrated the opportunity to buy more shares of a great company at bargain prices. Still, human nature being what it is, many do worry if a company’s stock price falls 10% or more in a matter of days. Know this: If history is a guide, when the next big recession hits, technology companies could be among the hardest hit. As wonderful as it is, Apple would not be immune to that. There are a lot of investment-worthy technology companies out there, and I hope to bring several of them into the Income Builder Portfolio. It nonetheless seems fitting that the biggest of them all will be the IBP’s first. Our $1,000 worth of Apple won’t quite challenge Warren Buffett’s position as a stakeholder, but every investor has to start somewhere, right? My article about the execution of our AAPL purchase, along with some pertinent valuation information, will be published Wednesday, June 27. As always, each investor should conduct his or her own due diligence before buying any company — even one that has the Oracle’s seal of approval.